When my children were younger, I remember reading them a book by Don Freeman called "Corduroy." It was a sweet book about a stuffed bear named Corduroy that we all enjoyed. 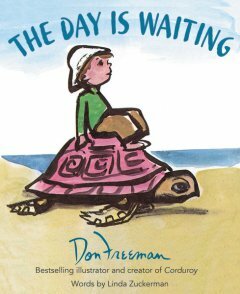 Recently, I found out about another book that includes illustrations by Don Freeman, but it was published after his death. He had left behind a collection of sketches and drawings that had never been published, so his wife passed them along to be used in making another children's book. Linda Zuckerman, a close friend of Mr. Freeman, wrote the words to match the illustrations that were found. The final product is "The Day is Waiting." It is a simple book, with one sentence or phrase on each page. It talks about getting out of the house to explore the world around us, enjoying the view, then realizing we always have home to return to. The illustrations have different styles and don't really give the book a harmonizing feel at first glance. But, I understand the reasoning behind the assorted illustrations, so that makes them okay after all. It is a nice little book to share with your young ones and discuss what "home" means to them. But, I can also see it as being a special graduation gift for your older child. When they are getting ready to see what is "out there" in our world for them to explore, they can take the book with them and it will be a reminder that they can always return home. Disclosure: I received this book free from the publisher through the BookLook Bloggers book review program. I was not required to write a positive review, and the opinions expressed are my own.